Everyone on the marketing team loves to hate PowerPoint. The question is, perhaps, why? Humans love visuals after all. In fact, good visualization can show potential connections, relationships, and important patterns that are not as obvious in non-visualized quantitative data. What is conDati Revenue Forecasting? 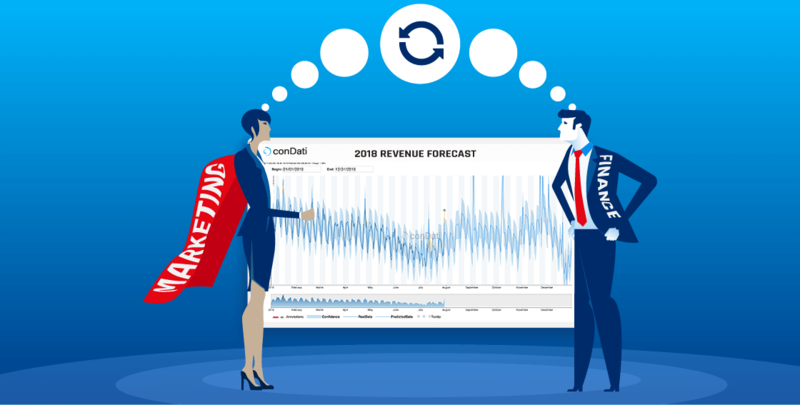 Great question: In brief, conDati Revenue Forecasting is a subset of conDati Marketing Analytics which uses time series modeling to create highly accurate and insightful revenue forecasts for your marketing campaigns. These forecasts give CMOs the ability to see, in dollars, the impact their disparate marketing campaigns will have into the future and across channels. On May 31, 2018, we launched conDati Marketing Analytics. Founders, investors, employees, and friends gathered to watch a live demonstration, hear from customers, and learn how conDati uses leading-edge data science to provide marketing teams the ability to use data-driven insight in their most difficult and important decisions.